No football ground this time, but still a football-related post. I was invited through my work to the Scottish Football Hall of Fame dinner at the Hilton in Glasgow. This annual dinner has been held since 2004. Every year a few legends are inducted to the Hall of Fame which is located at the Scottish Football Museum at Hampden. The induction of Maurice "Mo" Johnston had already been announced in the press. Other inductees were Steve Archibald, Bertie Auld, Jimmy Delaney, Alan Gilzean, Paul Lambert, Willie Maley, and David Meiklejohn. Graeme Souness had already been inducted in 2004 when he had other commitments but he accepted the induction tonight. I do not usually go to events like this so I took my camera with me. It was a great night! With Graeme Souness, the former manager of Rangers (and a few other clubs!). With former referee Hugh Dallas. The induction of Dundee and Tottenham Hotspur legend Alan Gilzean. The induction of Mo Johnston. Johnston was the first high-profile catholic to be signed by Rangers. Since he was also a former Celtic player it was a very controversial signing made by Graeme Souness. Johnston is currently the manager of MLS side Toronto FC. Former St Mirren and Celtic player Paul Lambert. The current Norwich City manager is also the last Scottish player who has lifted the European Cup (with Borussia Dortmund). 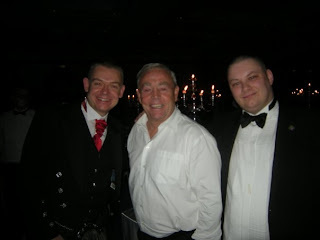 With Ian St. John and John from my work.